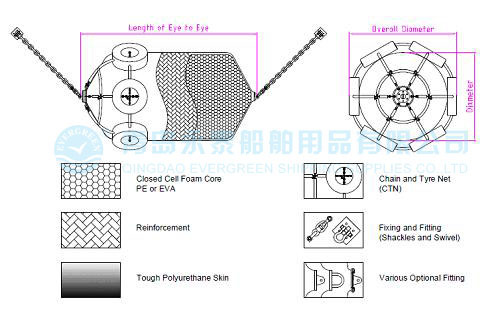 Evergreen manufactures the Ever-Cushion netted style foam filled marine fenders as the domestic standard in the industry and meets the most stringent quality and performance demands providing tough heavy-duty fendering systems for harbor, offshore and ship-to-ship applications. The widely used projects proven our Ever-Cushion foam fender is your best guarantee. A. A superior external chain and tire net, heavy-duty rubber tubing and chains that are connected at every intersection with a shackle. This is the key element in the Ever-Cushion marine fenders un-surpassed strength and resilience. B. The Ever Cushion™ has a heat laminated 100% closed cell and resilient foam core that is energy absorbing and cannot be ruptured. This fabrication process uses no adhesives, which decomposes after time therefore making the Ever-Cushion™ superior in quality, durability and function. This resilient foam-filled construction provides an unsinkable fender body that permits high energy absorption with a relatively low reaction force compared to most other fendering systems. C. In order enhance the performance of foam fenders, the Ever-Cushion™ foam fenders skin is constructed of tough and thick nylon filament reinforced polyurethane skin. The skin also has a nylon tire cord applied in a helix pattern during the coating that embeds the filament into the skin. Special layers are applied to both ends where stresses are highest. This advanced process makes the Ever-Cushion™ skin extremely durable to all weather, forces and marine conditions. D. Various optional fitting designs are available for different requirement. The integral swivel end fittings provide secure point of attachment without obstructing, even when the fender is compressed. The fittings and accessories are constructed of top quality steel (HDG).